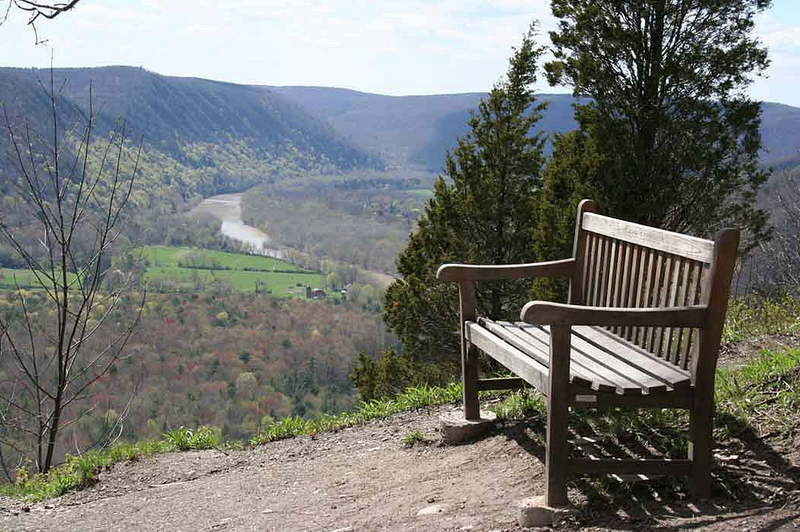 Our trails are open to the public from dawn to dusk, for free, 365 days a year. Obey posted signs and do not enter any restricted areas. These areas are home to threatened and endangered animals and plants. Help us protect and preserve the species in this ecosystem - do not collect any plants, animals, or other specimens. Do not bring in and leave any plants or animals. Dogs are not permitted on the trails by or leading from the Nature Center, Gleason Meadows/Frenchman's Bluff, even on a leash. If you wish to hike with your dog (and we hope that you will!) please drive just two minutes down the road to our dog-friendly trail system, Personius Woods. Curious about where else to hike with your dog? Here are a few ideas. No bicycles or motorized vehicles are permitted on the trails at either of our sites. No swimming, fishing, hunting, trapping, boating, skating, or camping is permitted at either site. 1. Where are these trails, exactly? 2. 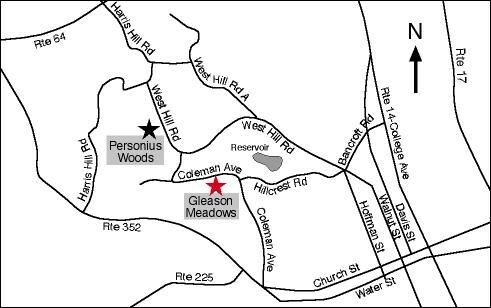 Where do the trails at Gleason Meadows/Frenchman's Bluff go? What are they like and how long are they? All this information can be found by clicking on this handy map (PDF). 3. Where do the trails at Personius Woods go? The map is here (PDF) but alas, it is a work in progress, and so we do not have the mileage for the trails nor the topo lines of our Gleason Map. (We are looking for volunteers to make a better map!) But all told - you have to walk ALL of the trails to get about a 5k loop. There is diverse habitat: a stream, meadows, mixed forests. We have snowshoes for rent, for kids and grownups of all sizes! Snowshoeing is an easy, healthy way to get exercise, have fun, and walk on top of the snowpack like so many of our native animals. Members receive a discount on snowshoe rentals. If looking to rent snowshoes with a group, please call ahead. Rental fees for members of Tanglewood: $4/hour, or $12/day. Rental fees for folks who aren't members yet: $5/hour, or $15/day. Are there Timber Rattlesnakes at Tanglewood? Yes, usually from June through mid-September, we do get Timber Rattlesnakes. (So does Harris Hill. So does Steege Hill. So does the a great deal of land in the Twin Tiers in NY and PA.) If you’re hiking during those months - on our trails or someone else’s - please be cautious. For a safe encounter with a live Timber Rattlesnake, please come view the one living on display in our Nature Center and Museum! Yes, they are venomous. They are a non-aggressive snake, and they will not go out of their way to strike you. But do not test this, and do not get too close. Generally, they just like to sit in the sun and bask, but they do startle and slither off from time to time. What should I do if I see a Timber Rattlesnake? Do not touch them under any circumstances. If you see one on Tanglewood’s trails at Gleason Meadows/Frenchman’s Bluff or at Personius Woods, please notify an employee at the Nature Center, and let them know where you saw it, and how big it was. They are an endangered species. By law, you are not allowed to touch them, move them, or harm them. We have them and protect them because historically they are a part of our region. Since they are an endangered species, and we care deeply about preservation, we want to ensure that they do not go extinct. What do I do in case I get bit? First, don’t panic. Call 911 immediately. Let them know what happened. They will be able to contact the local hospitals to see where to get anti-venom. You will want to get to a hospital to be treated with anti-venom as soon as possible. Remember: don’t panic.